CO2 OEM-Systems - G & W Machinery Sales, Inc. The CO2 OEM series are the most advanced and reliable industrial grade sealed CO2 laser marking and laser cutting systems available on the market today. With a host of configurations and options, the OEM series are ideal for integrating into an assembly line with or without a PC. Vytek has a range of choices and integrated laser designs for you to choose from. The OEM series includes laser control and power supplies and each model is in one housing for the scan head. The CO2 OEM series is available in power ranges from 35 to 400 watt outputs. 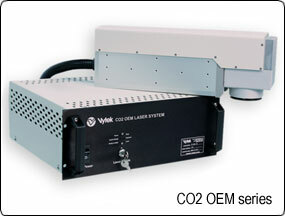 Contact a Vytek representative today to learn more about the OEM CO2 laser marking and laser cutting series.